8 "A stronger global movement"
Rishi Awatramani is a Washington DC activist. Works at Johns Hopkins University, and was previously Organizing Director at New Virginia Majority. Previously he worked at, Causa Justa/Just Cause Oakland, Youth Media Council. 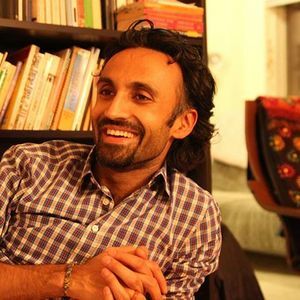 Rishi served on the US Social Forum National Planning Committee representing Leftist Lounge, has previously worked as a union and community organizer, and is a long-time activist with several organizations. Rishi Awatramani is an alumni of the Movement Activist Apprenticeship Program. Leftist Lounge (Chicago, IL) - Rishi Awatramani . In 2012, the URTHAChoir consisted of Lenina Nadal, Mark Swier, Rishi Awatramani, Lilo Carr Rivera. Victoria Menjivar and Sammie Moshenberg for Alexandria City Council 2012, Alexandria, VA.
With the Senate election in Virginia coming down to a photo finish, Mr. Kaine, a former governor, figured that a Democratic army of Faiza Abdulles would make the difference. Republicans, with their own army of door knockers, are hoping that their ground game can eke out a victory by one or two percentage points for George Allen, a former governor and senator. It is a street-level fight of neighborhood canvassing and phone banks conducted largely out of sight and distinct from the ad wars carpet-bombing televisions in Virginia. On the periphery are separate get-out-the-vote, rally-the-faithful efforts motivated by Mr. Obama but carrying along Mr. Kaine’s message. Canvassing has been going on for months, financed by at least three unions, Planned Parenthood and New Virginia Majority, the group Ms. Abdulle was working for, which is aimed at an expanding immigrant community that has helped turn Virginia from reliably Republican to a battleground. They may be reliably Democratic, but the women, immigrants and minorities targeted by New Virginia Majority are unreliable voters. Members of the Virginia New Majority Organizing Academy April '13 closed Facebook group, accessed November 17, 2017 included Rishi Awatramani . The Left Strategies Collective was founded to create conversation within the Left around strategy development. Between 2013-2014, the Left Strategies Collective conducted a number of national calls bringing people together to talk about issues such as Worker Organizing in the 21st century, and Lessons from the Moral Mondays movement. Left Strategies Collective members: Rishi Awatramani, Jake Carlson, Bill Fletcher, Jr., Jon Liss, Garry Owens, Biju Mathew, Merle Ratner, Claire Tran, Helena Wong. Those invited, on Facebook included Rishi Awatramani. Those expressing interest in attending, on Facebook included Rishi Awatramani. In October 2017, Rishi Awatramani LeftRoots signed the letter The Left We Want to Build: Breaking Out of the Margins. Signatories included Rishi Awatramani , LeftRoots. Thank you all for joining our Left Unity call in May, about electoral strategies. We will be sending out a report on the call soon. In the meantime, we wanted to extend an invitation to you to join an online discussion on Thursday, June 28, at 5:30 pm Pacific / 8:30 pm Eastern, with left organizers from the Rainbow Coalition. The Rainbow was a multiracial progressive formation that propelled Rev. Jesse Jackson's campaign for the Democratic presidential nomination in 1984 and 1988. The current list of panelists includes Bill Gallegos, Jamala Rogers, Ellen David Friedman, Ted Glick, and Cathi Tactaquin, with Bill Fletcher and Rishi Awatramani moderating. The panel will attempt to draw out lessons from the Rainbow years for left movement activists today that are once again attempting to build independent political power through electoral strategies and also contest for power within the Democratic Party. This page was last modified on 22 April 2019, at 02:22.